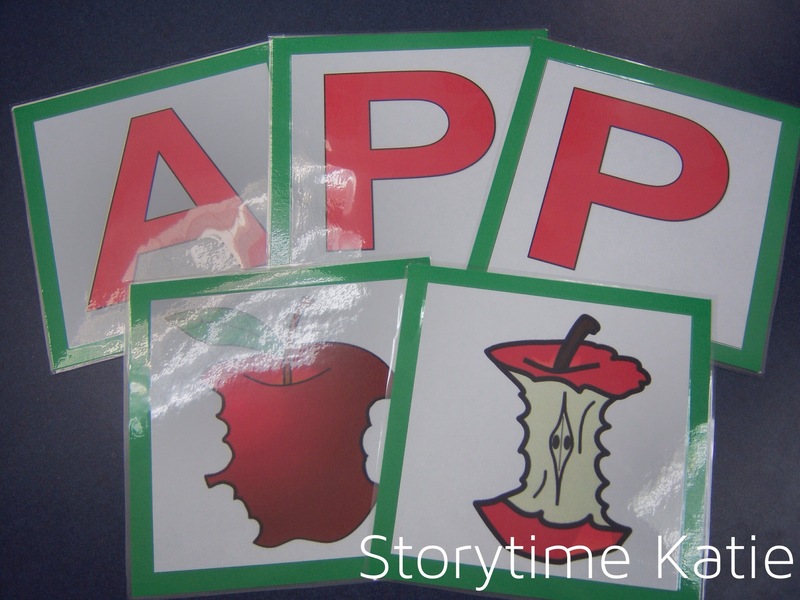 For more information on how I plan and prepare my toddler storytimes, check out this introduction post. And for a complete list of the repeating extension activities, visit this post. I starred the materials used in the plan; multiple stars indicate use for more than one session. Library programs can be considered a child’s first class. Encouraging personal interactions with the group leader help children develop a positive attitude toward learning. This was the class where we realized that we needed bouncers at the storytime door. We do registration-based storytimes and we had five non-registered kids sneak in to the storytime room. Since we don’t know everyone on sight on the first day, our room was uncomfortably packed. This was my second session and I was so excited to see so many familiar faces. Their favorite activity was Apple BINGO. My afternoon session is much more intimate since I only have eleven registered patrons instead of the usual twenty. I really enjoyed getting to have more one-on-one time with each child and adult. This week, they loved “Pepo and Lolo” the most out of all of the activities. The puppets were a huge success in “Five Red Apples” — the kids loved when the puppets “ate” the apples. My adults were great during “Ten Red Apples” as we counted along, with lots of voices chiming in. After a summer of no toddler times, the kids were SO HAPPY to see bubbles again. They was such great bubble popping enthusiasm! I love so many of your ideas! Thanks for sharing them. One caught my eye and I couldn’t find any backup, so thought I’d ask. You mention ‘Apple Bingo’. Was that a game or song or fingerplay? I could think of many ways to go with it, but you mentioned that your children liked it. Thanks! It’s coming up on a future Flannel Friday post. I will give you the direct link to the photo though. Erin from Falling Flannelboards has PDFs available to make this one! You can find them here: Falling Flannelboards.